We have stressed the fact that prayer is an event that begins in the human soul. We have not dwelled upon how much our ability to pray depends upon our being a part of a community of prayer. It is not safe to pray alone. Tradition insists that we pray with, and as a part of community; that public worship is preferable to private worship. Here we are faced with an aspect of the polarity of prayer. There is a permanent union between individual worship and community worship, each of which depends for its existence upon the other. To ignore their spiritual symbiosis will prove fatal to both…. [The] truth is that private prayer will not survive unless it is inspired by public prayer. The way of the recluse, the exclusive concern with personal salvation, piety in isolation from the community is an act of impiety….Our relationship to [God] is not as an I to a Thou, but as a We to a Thou. In this reading, Rabbi Heschel suggests that our spiritual lives depend on our common prayer, and our prayers remain somehow incomplete when we restrict ourselves to private prayer. That good rabbi argues that private prayer and prayer actually depend upon each other. He calls this a spiritual symbiosis; private prayer and prayer in community need each other for either to be able to thrive. In the final section, Heschel clearly offers a gloss to Martin Buber’s classic work, I and Thou. 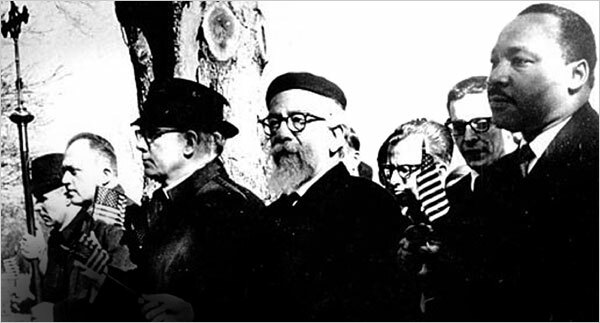 Rabbi Heschel suggests that the really important relationship is We and Thou. Most of us belong to many communities of faith. We’re members of churches or parishes, prayer groups, study groups, families, religious orders or just people who gather together for prayer, study and accountability. Each of these support, enhance, complete and inform our private prayer and our spiritual lives. In one sense, our collective prayer and our private prayer are like the two levers on a pair of pliers. Neither of them have a great deal of utility alone; together, they combine to achieve their purpose. We not only enrich each other; we come to depend upon each other. And somewhere in that process, we discover that these relationships are icons for the relationship which really sustains us: our relationship with the Living God. This entry was posted in Uncategorized and tagged Anglican, Bible, Disciple, Christianity, discipleship, Dominican Order, Episcopalian, Heschel, Love, Moral Theology, Prayer, Religion, Spirituality, Theology. Bookmark the permalink. Very true, Brother, that private prayer and community prayer are both necessary. But I do believe that God calls some away from the community to speak to them in private so that, in time, they can come back to the community bringing their knowledge and experience. It is their responsibility to bring back what they have learned. I think we’re of one mind, Sister. Sometimes, we’re called away, but I think we always return, in one way or another. It is good to pray at all times and in all ways – St.Paul. Then there is no need for distinguishing between private and community prayer, it is all one. I’m sure as a good Franciscan, you know the rich value of community, of many communities. Sometimes, we struggle to find God in there. That particular pearl, I think, is always worth the dive. How appropriate that I would read this, right after reading the same sentiment from Dietrich Bonhoeffer! God is really driving this home for me! I am one of the ones who’ve been hurt by church, yet my spirituality is rooted in the BCP. I pray always with others in mind, but I am just tired of Christians disapproving me for my sexuality. It is difficult, but I know my husband and I form a community of faith, very dear friends are part of my “parish” and this blog is becoming more and more a part of my community. I sometimes ache for the Eucharist, but I am just so tired of the inhospitality of “Christians.” Even in the Episcopal Church, with its wonderful emphasis on the social gospel, there is seldom (in my experience) a call to repentance for the homophobia in the pews. Not all of us “recluses” are unaware of the world. I am so terribly sorry for the heartbreak you’ve felt. There are few wounds like Church wounds. I cannot imagine foregoing the Eucharist, and know that must cut very deeply. I pray that you find your way back to peace, and that we all understand that we are not yet the Church God wants us to be. I count you as a friend, and a brother. Interesting. I have lost interest in prayer lately. Perhaps I should join others in order to regain this interest of communing. Thank you. You’re most welcome. I hope you recover the sense of prayer’s importance in your life. This is truth. We need each other in this forming of prayer. Thank you. You’re most welcome, Katie. I wonder if learning to need each other in prayer might not help us learn about a more generalized interdependence, and finally about our dependence on the Source of all holiness. Thanks for your support, and friendship. It is a divine reminder to me, today, as I have been feeling the intense need lately for more than just corporate prayer, but a small group to pray and lift up our hearts to God in prayer, at work. Yet another knock at the door to my heart … perhaps it is time to dare to grab the handle! I probably need to grab that handle myself, Carole. I hope you are well, and wish you a deep, abiding peace.